More than 3,321 plant protection chemical products for rice and 260 products for vegetables are on the market. A report of the Ministry of Agriculture and Rural Development (MARD) found that Vietnam spent $989 million in 2017 to import pesticide and materials, up by 36.4 percent over 2016. The imports mostly came from China, worth 52.6 percent of total import value. The imports in the first nine months of the year were lower than the same period last year, but Vietnam still had to pay $681 million for the products, 49.4 percent of which were from China. In the last five years, Vietnam spent $500-700 million a year to import pesticide products and materials from China. About 48 percent of imports (19,000 tons) were herbicides and 32 percent (16,400 tons) pesticides, and 900 tons were growth regulators. Of these products, herbicides were used for all kinds of plants, especially on rice. Farmers can use 3,321 plant protection chemicals products for rice alone and 260 products for vegetables. Fruit trees such as cashew, pepper and coffee have dozens of pesticides per plant variety. The experts attending a workshop on managing and using plant protection chemicals all agreed that the amount of chemicals used in cultivation had become ‘alarming’. They said that farmers now are ‘addicted to using pesticide’. Meanwhile, chair of the Vietnam Federation for Agriculture and Rural Development Ho Xuan Hung commented that Vietnam was among the countries which use plant protection chemicals in large quantities and in an uncontrolled way. MARD affirmed that as Vietnam is striving for safe agriculture, it needs to tighten control over chemical use and eliminate toxic chemicals. Hoang Trung from the Plant Protection Agency said the current legal framework in the field has loopholes. Vietnam encourages farmers to use biological products instead of chemicals, but the policies are not attractive. 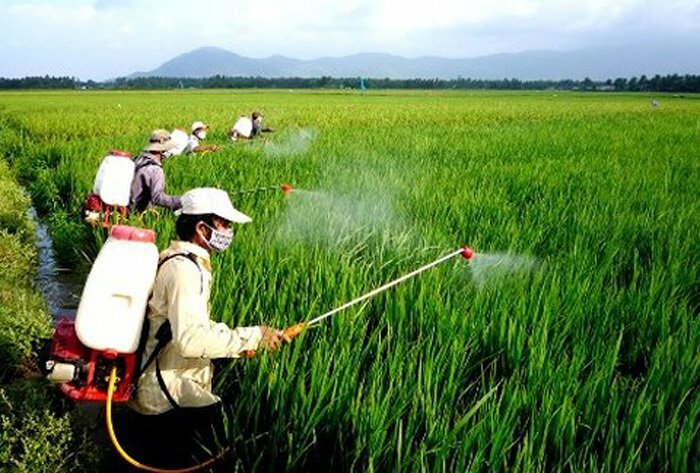 MARD on August 28 decided to exclude four active elements (used in 36 commercial products), namely Acephate, Diazinon, Malathion and Zinc phosphide, from the list of elements which can be used in Vietnam. One year before, MARD also weeded out another seven active elements, or 1,060 commercial products from the list. Chair and general director of Loc Troi Group, Huynh Van Thon, said the plan to use 30 percent biological plant protection products by 2020 would be a challenge to meet. Analysts also say that biological plant protection products are more expensive and many farmers are not familiar with them.